One hundred years ago a great Canadian, Sir Wilfrid Laurier, predicted that the twentieth century would belong to Canada. He had a plan to make it so. What happened? Canada lost sight of Laurier's plan, and failed to claim its century, dwelling instead in the long shadow of the United States. In a bold, fascinating and though-provoking call to arms, Brian Lee Crowley (author of the national bestseller Fearful Symmetry) and co-authors Jason Clemens and Niels Veldhuis envision Canada's emergence as an economic and social power. While the United States has been squandering its advantages - including making a series of bad decisions that precipitated a global economic disaster from which it struggles to emerge - Canada finds itself on a path leading itself out of the shadows into a new prosperity that could, if we stay the course, make us the envy of the world. It won't happen without effort, however. We must be prepared to follow on reforms enacted at the end of the twentieth century, completing the work already begun. If we succeed, Canada can and will become the economic outperformer that Laurier foretold, a land of work for all who want it, of opportunity, investment, innovation, and prosperity. America's performance, by contrast, risks trailing ours until it embraces Canadian-style reform: courageous and far-seeing. Laurier did indeed predict the Canadian Century. He was absolutely right; he was merely off by 100 years. Click here to see the illustrative infographic that gives an overview of the last 50 years of fiscal policy in Canada, placing the Redemptive Decade in context and showing the challenges still ahead if Canada is to claim its century. ***UPDATE*** Bank of Canada Governor Mark Carney displays his framed copy of the infographic that will soon adorn his walls at the Bank of England. *Now available - The Canadian Century is available in softcover for $25 (shipping included). It can be purchased through PayPal (use PayPal button below) or by cheque to the Macdonald-Laurier Institute, 8 York Street, Suite 200, Ottawa ON KIN 5S6. Please ensure that you include a request for the book with your purchase. Click here to read reviews of The Canadian Century. It is refreshing and encouraging to see these important policy thinkers in our country pointing out that Canada doesn't need to take a back seat to anybody, and that our fate lies within our own hands if we have the courage, the energy and the enthusiasm to grasp it. It is not often that Canadians talk about moving out of America's shadow—for far too long we have simply assumed that being in that shadow was the natural order of things. Crowley, Clemens and Veldhuis remind us that Sir Wilfrid Laurier thought that all things were possible for us, and today they show, with an impressive array of facts to support their argument, that Laurier's plan for Canada can still carry us through to that Canadian century we have all been eagerly awaiting for over a hundred years. As the U.S. and other nations struggle to defuse some potentially disastrous fiscal time bombs, The Canadian Century makes a compelling argument that the world should be looking to Canada for lessons on how to get reform right. Crowley, Clemens and Veldhuis tell a compelling tale of Canada's economic policy history over the past 100 years from the perspective of Sir Wilfrid Laurier's vision. Many Canadians will be familiar with Laurier's boast that "the twentieth Century would be filled by Canada". There will be less familiarity with his policy prescriptions and hence perhaps scepticism that the authors' approach can work. But it works exceedingly well. First because Laurier's ideas, once highly controversial, now seem so sound. Who now doesn't believe in individual freedom and responsibility; competitive taxes with fiscal balance and; self-confident engagement with the United States? Second because the authors strike exactly the right balance with enough detail to keep the most ardent policy wonk captivated while writing in a breezy style that will engage non-economists. And as with a good novel the authors leave us in suspense. The policy successes of the Redemptive Decade, highlighted by the federal and provincial governments slaying their deficits, have put Laurier's vision of Canadian world prominence back into our grasp. But some serious challenges, including the return to deficits and Canada's ailing productivity performance, make that grasp a bit shaky. I urge people to read this compelling tale and then like me, anxiously wait for a sequel to see how the story ends. The Canadian Century reminds us that the temptation for governments to solve all our problems with higher spending always ends in grief – a lesson the US will soon learn. It's a reminder that prosperity can be ours if we remember Wilfrid Laurier's legacy of liberty, lower taxes and smaller government. Crowley, Clemens-Veldhuis draw an intriguing link between the 19th Century convictions of Wilfrid Laurier – individual liberty and responsibility, minimal taxes and rules, maintenance of an open, competitive edge vis-à-vis the US – and the policy prescriptions needed to ensure a brighter 21st Century for Canada. Their thoroughly documented analysis of the "redemptive decade" which ushered in Free Trade, the GST and deficit control demonstrates how Canada has acted in its own best interest. Moreover, they show that if we establish a real advantage vis-à-vis the US on tax and other policies that will increase both our attraction with emerging powers and our leverage with the US. The question the authors pose is whether we have the wherewithal to finish the job. This timely and provocative book will remind Canadians that the smart fiscal and trade policies pursued by governments of all stripes in the past two decades has made Canada a star at the beginning of this Century. But history should not repeat itself. What we have achieved recently is what Wilfrid Laurier understood to be the right path forward for the last century. Instead, wars and economic depression led to inefficient government spending, high taxes and deficits, and protectionism. Canada should avoid this poisonous policy recipe in the coming years to fulfil Laurier's dream of a truly great nation of the North which we should rightly be. I often say the fundamental problem with our bilateral relationship is one of assumptions: Canadians think they know everything about the United States, and Americans think they know enough about Canada. And of course, we all could do a whole lot better learning a whole lot more about one another. The Canadian Century offers the perfect tutorial for folks on both sides of the border. 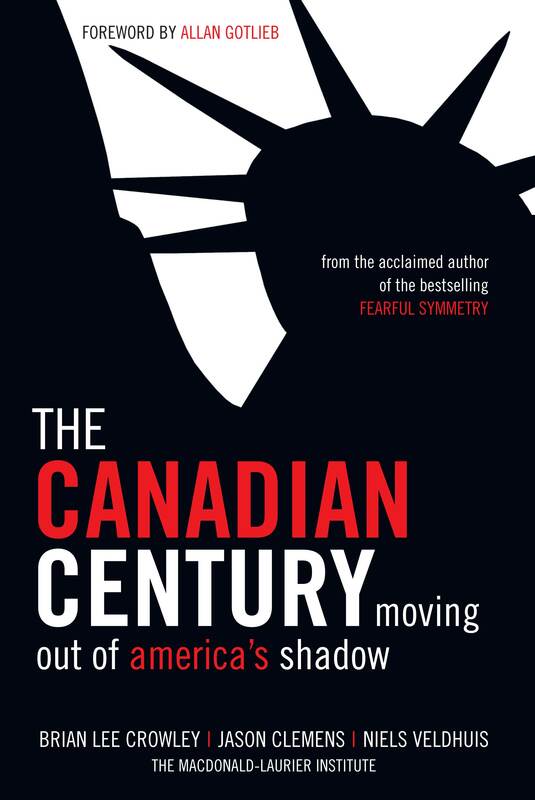 Thoughtful, clear-eyed and provocative, The Canadian Century explains why the US ignores our dynamic neighbors to the north at our own peril. Canada has been building a safe and stable fiscal house for decades, proving itself a powerhouse on the global stage and a most vital economic, energy and military partner to the United States. The authors provide a compelling – and optimistic – analysis of both the challenges and the triumphs the future offers our two dynamic democracies and make the case why the US-Canada partnership is so worthy of our leaders' time and attention. Sir Wilfrid Laurier proclaimed it would be "Canada's century". He put in place policies of open immigration, free trade and investment and a self-confidence attitude to our southern neighbour, that set in motion a half century of progress. Crowley, Clemens and Veldhuis, the authors of The Canadian Century, an engaging and informative romp through our last hundred years, convincingly demonstrate that prosperity does grow from liberty's soil. The book is also an endorsement of the too often maligned Canadian federalism. Our founding fathers got it right. The provinces have come into their own as incubators of change, innovation and experimentation with application to the national level. Entrepreneurship, hard work and self-reliance are deeply ingrained in our psyche. During the redemptive decade of the nineties these virtues were resurrected. In tandem with concerted actions by the different levels of government, we put right the debt and despair created by a couple of dark decades when we wobbled towards what the Wall Street Journal described as "third-world status". Limited government, light taxes and fiscal discipline, argue the authors are the ingredients that bring gold in the Olympiad of nations. This wonderful book is an urgent wake-up call for Canada's current leaders—of all political stripes—and raises crucial economic issues that should be top-of-mind in coming federal elections. Crowley, Clemens and Veldhuis remind us of Sir Wilfred Laurier's ambitious vision for Canada in the 20th Century, founded on freedom, small but sensible government, and confident engagement with the world. After thirty years of expanding questionable social programs with borrowed money, they argue that Canada's "Redemptive Decade" of the 1990s saw us return solidly back toward Laurier's vision. But the danger now lies in the back-sliding that has occurred in the past decade, with rapidly growing government spending and a return to complacency about public debt. Now is the time to reaffirm the power of Laurier's vision, to make some courageous policy decisions, and to thereby ensure that the 21st Century belongs to Canada in the way Sir Wilfred intended a hundred years ago. Will Canada's political leaders pay attention? A generous helping of economic history, served up in a very appetizing way! Hopefully our public policy decision-makers will pay heed to this book and realize that those who do not learn from history are doomed to repeat it.